Did you know the same plaque that decays your teeth can cause major heart problems? What if you could fight plaque and heart failure both by improving your oral health? Dr. Yakowicz in Belleville is here to tell you more! Someone dies from a heart attack every minute, according to the American Heart Association, and most heart attacks (and 85% of strokes) are caused by cholesterol build-up – aka plaque. But there is good news. You can work with your Belleville dentist and your doctor to understand and minimize your risk factors for developing plaque and tooth decay. In 2010, tooth decay was the most common condition in the world! Everyone struggles with tooth decay and plaque build-up for reasons unique to their own body and lifestyle. By learning what puts you most at risk for decay, you are investing in your health for the long term. This one you can’t control, unfortunately. Some people are just more likely to develop plaque in their body due to genetic predisposition. It’s important to share your family health history with your Belleville dentist and doctor. Your body is full of bacteria—good and bad. Optimal health relies on habits that fight bad bacteria and promote good bacteria. Bacteria in your mouth can quickly move into the rest of your body via blood and muscle tissues. Keep the bad bacteria at bay by snacking less, eating less sugar, and brushing your teeth twice a day. All the food you eat (and when you eat it) changes the environment in your mouth. Snacking is a bigger problem than you probably realize because it makes your mouth like a nightclub for bad bacteria, which leads to plaque build-up. Shut down the bacteria party by eating larger meals of healthy food and snacking less. Saliva is the natural fluid in your mouth that rinses away plaque and helps us break down our food. But other health conditions can affect how healthy your saliva is. For example, prescription medicines and aging slow down your ability to produce enough saliva. Talk with both your doctor and your dentist if your mouth feels too dry. pH is a measurement of acidic versus alkaline (or basic), and a good overall gauge of how healthy your mouth and body are. Every time you eat, the pH of your mouth becomes slightly acidic. This is totally fine and normal. But when you snack all day, it keeps your mouth acidic longer than is healthy. Eating sugar also keeps your mouth acidic longer than other foods. Acidic environments are a breeding ground for plaque build-up and decay. You can improve your pH balance by eating a bit of cheese and rinsing with water after having snacks or sugary sweets. So, why spend all this time learning about what’s going on in your mouth? The term “oral-systemic link” is exactly what it sounds like—the link between your oral health and the health of your general body systems. This link is your first step to fighting risk factors of decay and fighting the plaque that causes it. Did you know if you have heart disease, you’re 50% more likely to have gum disease, and if you have gum disease you’re 50% more likely to have heart disease? Both diseases are issues with chronic inflammation and should be addressed together. Oral infections and bacteria in the mouth and throat are a major risk factor for heart attack and diabetes. These examples illustrate how your risk factors for poor oral health are also risk factors for larger health problems. Your body is so connected on so many levels. 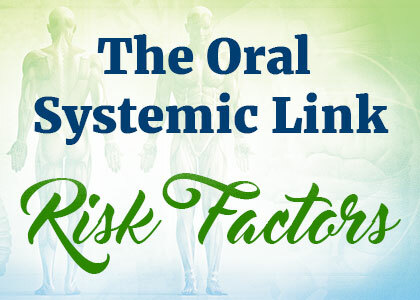 Understanding the oral-systemic link will benefit the health of your mouth, your body, and your entire life. The bottom line is that taking care of your teeth and mouth is very important for achieving and maintaining your overall health. It can even improve sleep and decrease stress! Who couldn’t use more of that? By taking good care of your mouth, you are helping prevent more serious health problems before they even start. Give your health a fighting chance, and find a dentist that will assess your risk factors and help you make healthy changes. Dr. Yakowicz in Belleville can talk with you about your health goals and help you reach them. Make an appointment at Neighborhood Smiles to learn more about your own risk factors and how to control them! Coronary Plaque Disruption. Circulation. August 1995. Periodontal microbiota and phospholipases: the Oral Infections and Vascular Disease Epidemiology Study (INVEST). Atherosclerosis. October 2015.